Topics: Events, Projects, Alameda County Democratic Party, Los Angeles, and Orange County. Age: It went live on May 30th 2004, making it over 13 years, 10 months old. Softlayer Technologies Inc (Texas, Dallas) is the location of the Apache server. Its 5 DNS Records include, dns2.name-services.com, dns3.name-services.com, and dns4.name-services.com. 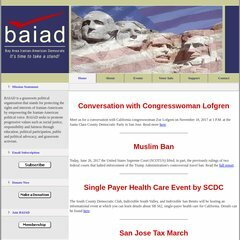 Baiad.org's IP address is 50.22.91.170. PING (50.22.91.170) 56(84) bytes of data.